E-way bill provisions are all set to take place on February 01, 2018 for all the inter-state movements of goods. The states may choose any date before June 01, 2018 for applying E-way bill provisions on intra- state movements of goods. This means that intra- state movement of goods will also fall under E-way bill provisions mandatory w.e.f. June 01, 2018. E-way bill was also the part of VAT regime wherein it was created under the name of Delivery Note. This delivery note was carried along with the goods which provide the proof that goods being carried are already uploaded on the server of the department and hence no evasion of tax. The above system used to be manual system wherein the Delivery Notes were collected from the VAT department and later on its utilization statement is submitted. Under GST, one system is being developed for the generation; cancellation etc. of E-way bill. If different states had separate systems for generation of E-way bill it would have resulted in difficulty to cross-verify of such E-way bill and also result in hindrance of movement of goods and free trade from one state to another. E-way bill is a document generated on uploading the transaction’s details and transportation’s details before the commencement of movement of goods. E-way bill contains the detail of goods, GSTIN of the recipient, invoice number, invoice date, value of goods, HSN of goods etc. E-way bill number is 12 digits number and this bill also contains QR code which helps in easier and faster verification of E-way bill by the tax officers. When E-way bill is required? Whenever there is movement of goods the value of which is exceeding Rs. 50,000, then the registered person causing movement of such goods needs to generate E-way bill before commencement of such movement. The movement of goods may be due to Supply, reasons other than supply or inward supplies received from unregistered person. The E-way bill may be generated even for consignment less than Rs. 50,000. 1. When goods are sent by principal inter-state for the job work. Who will generate E-way bill? There are four stakeholders involved in the movement of the goods from one place to another. They are supplier, recipient, transporter and tax officers. The generation of E-way bill is the responsibility of any of the first three stakeholders. If the goods are sold by unregistered supplier to a registered recipient then the movement of goods is said to be caused by such recipient if the recipient is known at the time of commencement of the movement of goods. For accessing the system of E-way bill, one needs to get himself registered on http://164.100.80.180/ewbnat10/. The above three stakeholders if registered will get themselves registered using the GSTIN otherwise there is one option for the unregistered transporters to get themselves registered. The registered person can get themselves registered by simply putting the GSTIN and OTP on the website. After entering the GSTIN all the information will get auto populated and user just needs to enter the OTP which will be sent on the registered mobile number. After this User ID and Password is generated to be used for future logins. The unregistered transporter can also get them registered by providing the details of PAN, business type, business place, Aadhar authentication etc. After submitting the details 15 digits TRANS ID is generated which is used to enter while creating E-way bill so as to enable the transporter to enter vehicle number for the movement of goods. First of all, user needs to select the type of transaction whether outward or inward. Outward means user is supplying the goods and inward means user is receiving the goods. After selecting the type of transaction, sub-type of transaction is selected. Thereafter, document type, number and date are entered on the basis of actual invoice which will accompany the consignment. The date should not be a future date. In the “From” table, for outward supply all the details of Supplier will be auto populated (Address can be altered in case of additional place of business) and for inward supply the supplier details will have to be entered and in case supplier is unregistered then user has to enter GSTIN as URP. Now all the details relating to the goods, HSN, value and GST will be entered. After that the user will select the mode of transportation – road, rail, air or ship (Part-A of FORM GST EWB-01 shall be entered by supplier or recipient where goods are transported by any mode other than road) and the approx. distance between the supplier and recipient. If goods are moved directly by the user then he may enter the vehicle number without entering the transporter details to generate E-way bill. The information given above shall be made available to registered supplier for filing GSTR-1. If the above information is given by unregistered supplier then he will be informed electronically if mobile number or mail id is available. Instead of above information user may upload tax invoice in FORM GST INV-1 by which Part-A of FORM GST EWB-01 will be auto populated. If the user is carrying out transportation through a third party, then user will have to generate the E-way bill by entering transporter’s details which includes transporter ID, transporter document’s number and date given by transporter. In case E-way bill is generated by entering transporter ID then transporter will have to login into his account to enter vehicle number while goods are getting moved. To generate E-way bill either vehicle number or transporter ID is required. But the E-way bill will be valid only if vehicle number is entered. However, the vehicle number (PART-B of FORM GST EWB-01) is not required in case goods are moved (Intra State movement) from place of consignor to the place of transporter for further transportation the distance of which is less than 10 kilometers. All the details mentioned above may be entered by transporter to generate the E-way bill in case it is not generated by supplier or recipient. 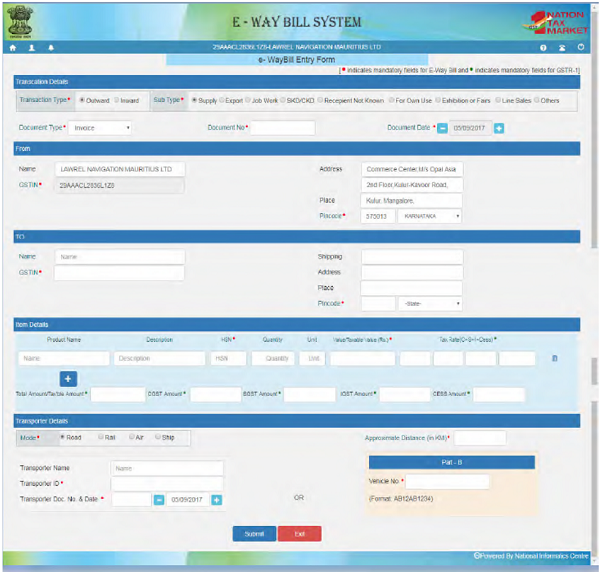 After submitting a 12 digit number E-way bill is generated which will be sent to supplier, recipient and transporter on the common portal. 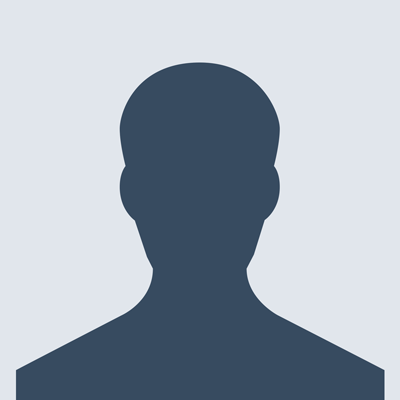 The person in charge of a conveyance i.e. transporter shall carry invoice or bill of supply and a copy of E-way bill either physically or mapped to Radio Frequency Identification Device embedded on to the conveyance. E-way bill may also be generated by unregistered person causing movement of goods. The user can update the vehicle number in case it was not entered while generating E-way bill or vehicle is being changed for any reason. It can be simply updated by selecting “Update Vehicle Number”. In case of intra state movement of less than 10 kilometers from the place of transporter to the place of recipient then detail of conveyance may not be updated. The E-way bill will be valid for a distance of up to 100 Km for one day and one additional day for every 100 km or part thereof. One day will be calculated from the date and time on which E-way bill was generated. Each day shall be counted as twenty four hours. The E-way bill generated under rule 138 of GST rules of any state shall be valid in every state or union territory. E-way bill cannot be deleted but it can be cancelled within 24 hours of its generation in case goods are not transported or not transported as per the E-way bill generated. However, if E-way bill is verified by empowered officer then it cannot be cancelled. The system also allows the transporter to generate a consolidated E-way bill in FORM GST EWB-02 by adding all the E-way bill numbers being carried in one conveyance. In case the E-way bill generated by other person against his GSTIN does not belong to him then such E-way bill may be rejected before 72 hours otherwise it will be deemed to be accepted. 2. Where goods are transported by non-motorized conveyance. 3. Where goods are being transported from the port, airport, aircargo, complex and land customs station to an inland container depot, or a container freight station for clearance by customs. 4. As may be specified by government. The officer may intercept any conveyance to verify E-way bill in physical form for all inter or intra state movements of goods and verification may be done through Radio Frequency Identification Device Readers. Information relating to each and every inspection must be recorded online in Part-A of FORM GST EWB-03 within 24 hours of inspection and final report in Part-B of FORM GST EWB-03 shall be recorded within three days of such inspection. Once goods are physically verified no further physical verification unless a specific information relating to evasion of tax is made available subsequently. Supplier sends material to transporters go-down on the invoice with e way bill, having validity for 2-3 days. we are sending material as per end customer requirement , requirement may come after 4 – 10 days, in this case what should transporter will do for eway bill which is expiring 2-3 days. The person causing the movement of the goods.